Well, I don?t know about you, but Star Wars Mania has hit our house! My kids are only 6 and 8yrs old but already they are Star Wars mad. Star Wars is everywhere and almost inescapable.. so I say: EMBRACE STAR WARS, do not try and hide! If you can?t beat them, join them. Anyway, I digress once again. 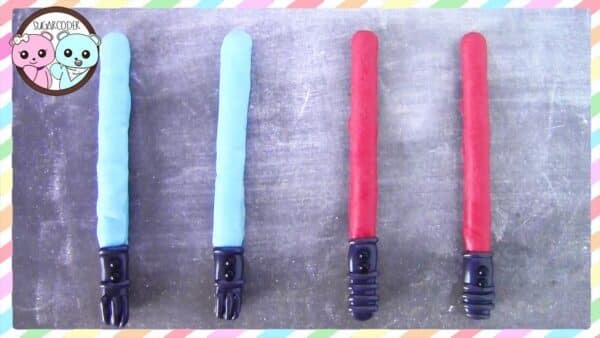 Today, my lovely friend the SUGARCODER has another FABULOUS DIY How To Treat to share with you and today they are these fantastic edible lightsabers. What I like about them, is that you can use breadsticks for the centre ? avoiding making these too ?sweet? a treat, if that makes sense. So if you are going to see the Star Wars movie and want to take along some Star Wars treats or if you are having a Star Wars party, you HAVE to make some of these edible lightsaber treats for sure! Have You Played? Dungeon Keeper 2?